Whew! It’s hot; I think I’ll get a refreshing drink of water to rehydrate my body and soul. Now imagine for a moment the water you’re able to get does not do that but makes you sick and causes your stomach to hurt instead. This is exactly what happens in different areas of the world. I personally saw the need for clean and parasite free water in just one of those areas, the Dominican Republic. 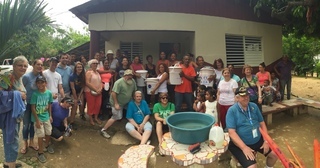 This May I was able to take a cruise where I had an opportunity to contribute hands on with the Wine to Water’s operation. It was there that I was able to work side by side with the locals to create and deliver a water filter which provides a family with healthy clean water for up to 5 yrs. In the Dominican Republic, forty percent of the population lives at or below the poverty line. Families have to spend a significant portion of their income to purchase bottled water. With the filter they can now use that money on other necessities for their families. I was so touched with the appreciation of the families who received this life changing filter that I knew I wanted to do more. I invite you to review the above clip and join me in donating to this worthwhile cause, and life changing operation. Any amount large or small will help. Congrats on a great campaign! Watch the below YouTube clip to see how the proceeds will benefit the people of the Dominican Republic. The proceeds from my campaign will go the the Dominican Republic. Lisa, thank you for being involved with such a worthy cause.